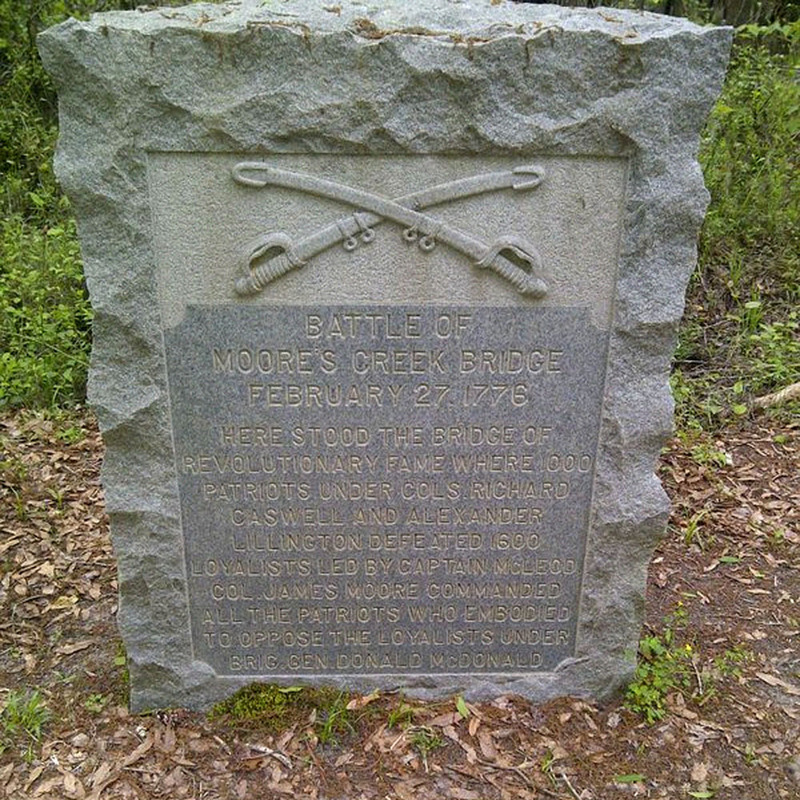 Source: Moores Creek Bridge Monument, Moores Creek National Battlefield. Photo courtesy of Erin Corrales-Diaz. This 3’ x 4’ x 6” granite monument has a polished frame on the front face where the inscription appears below a pair of crossed sabers rendered in bas-relief. 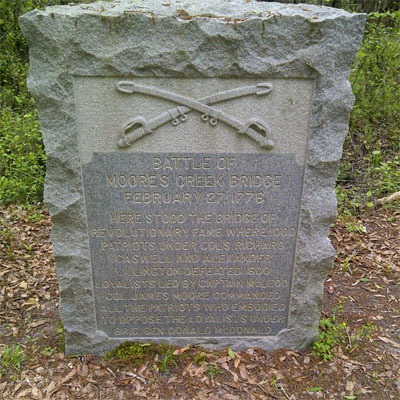 BATTLE OF / MOORE’S CREEK BRIDGE / FEBRUARY 27, 1776 / HERE STOOD THE BRIDGE OF / REVOLUTIONARY FAME WHERE 1000 / PATRIOTS UNDER COLS. RICHARD / CASWELL AND ALEXANDER / LILLINGTON DEFEATED 1600 / LOYALISTS LED BY CAPTIAN MCLEOD. / COL. JAMES MOORE COMMANDED / ALL THE PATRIOTS WHO EMBODIED / TO OPPOSE THE LOYALISTS UNDER / BRIG. GEN. DONALD MCDONALD. The monument may have been purchased with federal funds. During the period when Moores Creek battlefield transferred hands from the Moores Creek Battleground Association to the U.S. War Department, the new administration sought to move away from the previous emphasis on commemoration and focus on specifics of the actual battle. As a result, the Bridge Monument was erected as a part of the changing landscape on the battlefield, and the text was written by the Army War College. The monument is located near the historic road and beside the reconstructed bridge. The monument is tucked away on the battlefield near trees and shrubs beside the creek. Originally positioned in front of the reconstructed bridge, the monument was moved and rotated in 1938 so the inscription would be read from the south instead of the east. By moving the monument off the historic road to the side, it no longer obstructed access to the bridge. An annual ceremony is held in February with historic military demonstrations and reenactments.